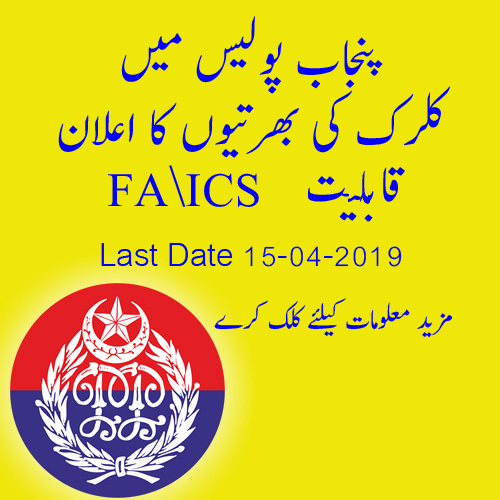 Punjab Police Announced Junior Clerk (BS-11) Jobs 2019 for Special Person on Regular Basis through Punjab Public Service Commission only for Punjab. The job nature is manages Police station record in Computer System. No field work job only works with in Police station and Permanent job not Contract Base. Higher Secondly School Certificate Second Division from recognize board and four month Computer MS-Word Diploma or ICS (Intermediate of Computer Science) from recognize board. And Typing Speed 35 word per minute in English and 30 word per minute in Urdu. Comprising Question on General ability which includes Pakistan studies ,Current affairs ,Geography General Knowledge Every day science , Basic Mathematics , English ,Urdu Islamiyat and computer studies .